The Best comedy show in Benin City is happening live in UNIBEN. 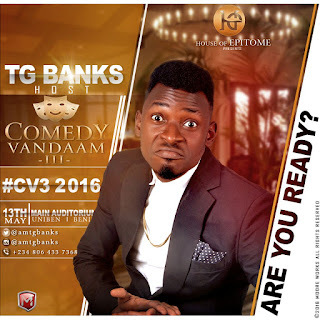 come the Third Edition of the Greatest comedy show in UNIBEN. Ladies and gentlemen, it is COMEDY VANDAMM 3. FIRST and SECOND EDITION was a hit back to back , THIRD EDITION promises to be BIGGER and BETTER. Get your ribs warmed up because COMEDY VANDAMM 3 will be a Rib-Cracker. Venue: The Uniben Main Auditorium. Bookings for CV3 shirts starts soon. The sample will be Unveiled soon. Come watch TG Banks in action. GET READY!! University of Benin Official Campus Gist and online publicity platform(UNIBENGIST).